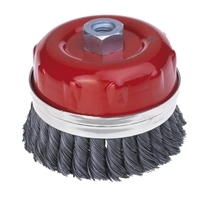 Applications: These cup brushes have M14 attachments to fit most angle grinders 115mm and larger. The twisted knot cup brushes give more aggression on weld splatter, heavily pitted areas, heavy rusting and old paint coatings, whilst the crimped wire uses brass coated steel giving a much more controlled action. We stock the popular 60-65mm size as well as a usefully large 125mm size which will give faster results on 125mm, 180mm and 230mm angle grinders. We have also intoduced an increased safety design with a protective plastic shroud to minimise the risk of broken wires flying off in use. These protected cup brushes are also higher speed rated. Product Notes: The twisted knot wire are made with pure steel, whilst the crimped wire wheels are made with brass coated steel (BCS) wire for flexibility and durability. All have M14 captive nuts for use on most angle grinder and metal polisher spindles. These are high quality products made in Spain. Twisted Knot - 65mm: 15,000rpm. 125mm: 6,500rpm. Crimped Wire - 60mm: 11,000rpm. 125mm: 8,500rpm. Protected Crimped Wire - 100mm: 13,000rpm.